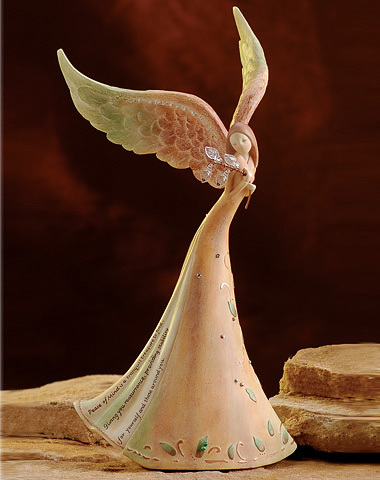 Angel Figure 9"H, Resin and stone mix, Embellished with beads and rhinestones. Message: Peace of Mind is a tranquil treasure to find. Giving you reassurance, providing stability for yourself and all of those around you. This angel can be given to someone who needs reassurance and inner strength in their life. She holds an olive branch close to her heart that is symbolic for peace. The translucent leaves represent how true peace transcends all things. The leaf pattern that decorates her skirt represents the peace and tranquility that we need in our lives. Her open wings personify assurance and suggest confidence.